An ancient Egyptian village dating back to 5000 BC has been discovered by a joint Egyptian-French team of archaeologists. It is situated at Tell el-Samara in the Nile Delta, about 87 miles (140 kilometers) north of Cairo, the capital of Egypt. At almost 7,000 years old, the village is one of the oldest discovered in this area where the Nile River flows into the Mediterranean Sea. Archaeologists hope the discovery will help them learn more about the early communities that settled in the Nile Delta thousands of years before the legendary King Menes. According to early historians, King Menes united Upper and Lower Egypt and founded the First Dynasty of ancient Egypt around 3100 BC. He is credited with founding White Walls (later known as Memphis), the capital of ancient Egypt for almost a thousand years. King Menes ruled during the Archaic Period of ancient Egypt’s history. The Archaic Period spanned from 3100 to 2686 B.C and laid the foundation of Egyptian society. The earliest known hieroglyphics date to this time and the concept of a god-like king was formed. Ancient Egyptians during this time were mostly farmers and relied on the annual flooding of the Nile River to irrigate and fertilize their fields. 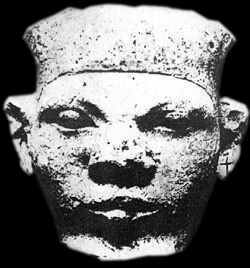 Modern historians have not conclusively identified who King Menes was, as archaeological records are scarce and rarely mention him. Instead, they believe that either Narmer or Hor-Aha, both rulers of Egypt around that time, was the real Menes who unified Egypt. Along with the remains of buildings, pottery and stone tools, archaeologists also found many storage silos at Tell el-Samara. These silos contain organic matter, such as animal bones and plants, which allowed scientists to roughly date the site. Archaeologists are continuing to analyze the organic matter to come up with more precise dates, as well as figure out what types of animals and plants they are. This will help shed light on how these communities lived. Researchers are also hoping the discoveries will help them learn when and how agriculture changed from relying on rainfall to irrigation methods. Excavations at the site will continue until next year and archaeologists hope to be able to uncover more details about how long the village was in existence, how it changed over time, and why it was abandoned.